All digital marketers know that pay per click advertising is a great tool to enhance site traffic and increase online leads. Its effectiveness can be attributed to the 3 common characteristics that all great marketing campaigns have – it’s targeted, predictable (to a certain extent) and measurable. The challenge arises when clients or marketing managers spend a considerable budget on pay per click advertising but do not see corresponding returns. If your digital advertising spend is not bringing you the results you want, it may be time to take a good, hard look at your current strategy to see if it needs fine-tuning. The important thing to remember is that you don’t need a huge budget to make an impact with PPC advertising such as Google Adwords. The Yankee Candles case study on the Google AdWords blog shows how you don’t have to spend beyond your budget to get your preferred results. The famous candle producer saw an increase in conversion rates by 600%, while cutting cost per conversion in half in this AdWords case study. All it takes is using the full capability of the system, and knowing what your goals are. How exactly can you increase your conversions while reducing (or maximizing) your Ad Spend? Let’s take a look. Although there is a wide variety of PPC ad servers, we will focus on Google AdWords in this blog. That’s because Google AdWords is probably the most well-established of the paid search and digital advertising systems. In fact, it is estimated that Google accounts for 97% of mobile paid search. This is easy to believe when you know that all of the ads you see on YouTube are driven via Adwords. The AdWords system is mature and can therefore be quite complex for new users to grasp. In most cases, using an agency to create and manage your account results in better long-term ROI. That being said, AdWords is not rocket science and you can reap the maximum benefits from it if you work smartly. Enable tracking. Measuring your ROI will not be conclusive if you are not actively tracking your AdWords efforts. Make sure you have conversion tracking enabled, either through AdWords or import your goals from Google Analytics. Remember, you want conversions that you are optimizing for in AdWords to be conversions that lead to revenue. I recommend you don’t track your secondary conversions (such as newsletter signups or PDF downloads) in AdWords. Keep those as goals in analytics, but don’t let AdWords try and get you more signups (unless this is your primary goal online). Check time-based reports. Keep track of your time of day reports and day of week reports to determine the most expensive times for conversions. You can then create a schedule that only runs ads at profitable times rather than peak (really pricey) times. For example, if your conversions are costing you $1000 on a Sunday but $100 Monday to Friday, then there is no point in keeping the ads running on Sundays. 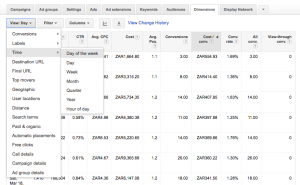 Currently you can find your time of day and day of week reports under the Dimensions Tab in your AdWords Campaign. Check your keywords. Don’t use expensive keywords that are not converting well. I suggest that once every six months (if not more frequently) you do a CSV export of all of your enabled keywords, with the time period set to all time. You can then sort first by cost per conversion, and then by total cost. The first keywords you should be removing are the ones with a much higher cost per conversion (CPC) than the average. Once you have identified those, then you need to look at keywords with a high cost and no conversions. Why spend money on keywords that don’t bring in the business you are looking for? Consider your geographic areas. Which areas are more likely to give you the best conversions? If you are a local business, international areas may be a waste of your ad spend dollars. You can also use Google Analytics to drill down specific areas in your target area that have a high conversion cost – maybe people in one specific province or state just don’t convert? Decrease bids in poor performing areas to use your budget more effectively, or exclude those areas all together. Consider your mobile breakdown. Look at your mobile traffic breakdown under the Settings tab and adjust your bidding accordingly. If the cost per conversion is low on mobile, increase the bids so that your ads show more often on mobile devices. Remember, a low cost per conversion is a good thing! You want each lead or sale to cost you less. Conversely, you can then decrease bids if the CPC is high. Give your negative list some love. The ability to decide that you don’t want your ads to show for certain search terms is one of the most powerful – and underutilized – tools in the Google AdWords arsenal. The easiest way to get the best out of your budget is to have an insightful and ever-growing list of negatives that will stop irrelevant clicks. The best way to grow your negative list is to take a good look at your Search Term report at least once a week. Under the Keyword tab in your campaign, just click on Search Terms and voila – Google gives you the exact terms that resulted in clicks. All you need to do is select the terms that are not relevant, and click on the Add as Negative button. 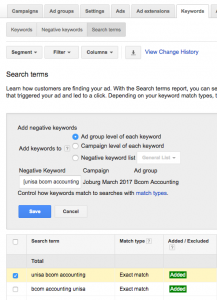 Google even asks if you want to add it as a negative on the Campaign or Ad group level!BTW: Did you know you can also add keywords as exclusions on your display ad campaigns so your display ads won’t show on pages that contain those terms? This is a really simple way of improving the contextual positioning of your ads. Choose your placements wisely. For display ads, make sure that you exclude placements that have high cost and low conversion, along with placements with very high impressions and no clicks. Mobile app placements often do not perform well for most B2B campaigns, and, as such, it can be effective to exclude adsenseformobileapps.com as a domain completely. You can see from the above that there are many strategies and tactics that you can use to maximize your digital ad spend. Although these tips are specific for Google AdWords, the thought process behind them can be extended to almost any pay per click advertising platform. Overall, make sure you are targeting the right people, at the right time with the right information, and always look back at your historical data to find out how you can better spend your valuable marketing budget. And when in doubt, get an expert, like a WSI Consultant to take a look at your campaign to receive advice on how it could be improved and better optimized – it could be the start of a fruitful working relationship!